I’ve got to be honest, I have never been a big fan of ski touring. Back in the 1990’s I have vaguely fond memories of trudging along sections of the Haute Route, camping in empty mountain refuges, all before the invention of modern day touring kit. I didn’t even own touring equipment, so used Telemark skis instead – great for going up, hell for going back down, especially through highly variable snow conditions with a weighty backpack to contend with (or perhaps it was my questionable Telemark skiing technique?). Ski touring really didn’t seem to catch on. And why should it? There were ski lifts in every direction, waiting to drop you on a mountain where un-tracked snow patiently waited for ones arrival – off-piste skiing was the preserve of the elite skier and feared by the masses. Simply stepping away from a marked ski run provided credible bragging rights over a beer and anyone with a backpack, well they were obviously mad. 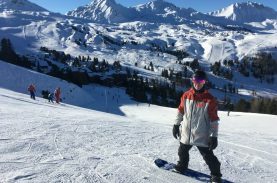 But as the sport developed, snowboarding grew and skis were reinvented, more and more people started to venture off-piste. 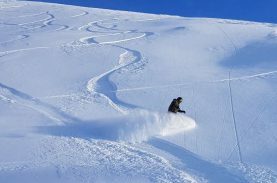 As space became a premium commodity, skiers (and more recently snowboarders with the development of splitboards) stared to push further afield and used their own steam to get there. Suddenly ski touring wasn’t the preserve of bearded, Geography teacher types who belonged to mountaineering clubs in Kendal (apologies to anyone who fits this profile, I mean no offence, in fact the opposite, I was in awe), but the really cool, young people who back-flipped off cliffs were doing it too. 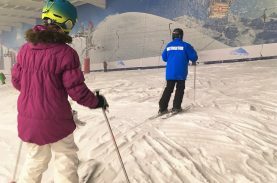 They wanted to access terrain that was much harder to get to – now simply skiing or snowboarding off-piste wasn’t enough. 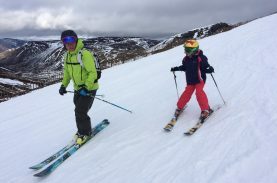 The big ski manufacturers jumped on board and ski touring equipment became the fastest growing area of the market and niche brands such as Black Diamond became mainstream. 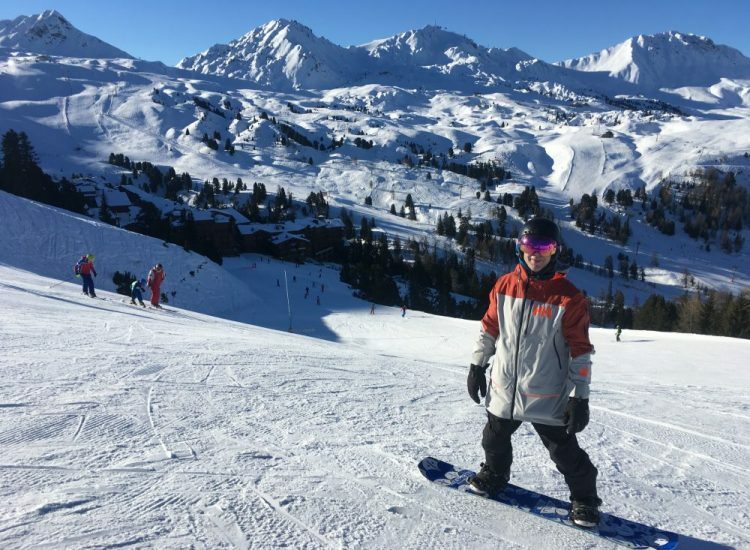 With the new equipment, lighter skis and bindings, better clothing and a large, growing group of ski enthusiasts to target, people also started to realise that this touring business was actually rather fun too. Thirty years ago, simply travelling to the Alps and sliding down a mountain was adventure enough for anyone. 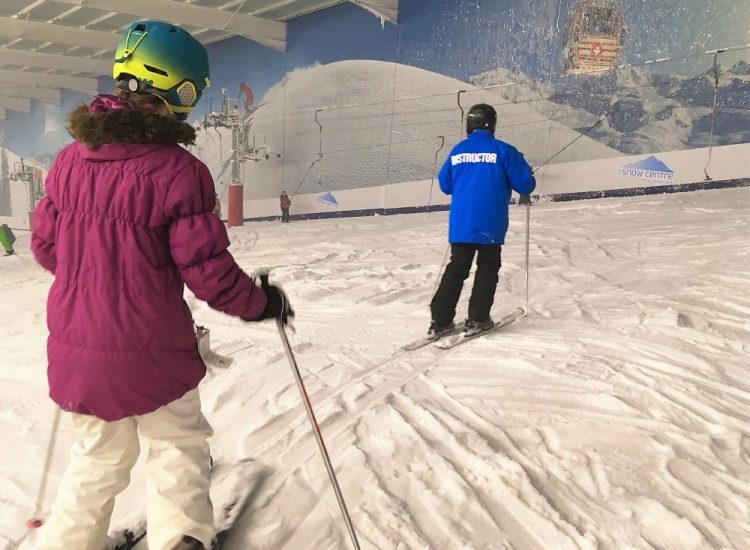 Now we expect more – better accommodation, slicker travel, fast, comfortable lifts to whisk us up, highly prepared groomed slopes to enjoy and top of the range ski equipment to rent. And we get it all, but many are searching for more still – a challenge, a physical and often mental adventure. 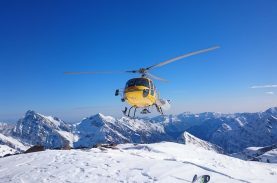 But whilst ski touring remains exclusive in the way that the point of it is to access backcountry and off-piste terrain that is still not for everyone – despite modern skis, a level of skill is still required as is the consideration of safety as ski tourers are exposed to the dangers of avalanches. A whole group of people exist that look at the sport and think, ‘that is for me’. Who are these people? 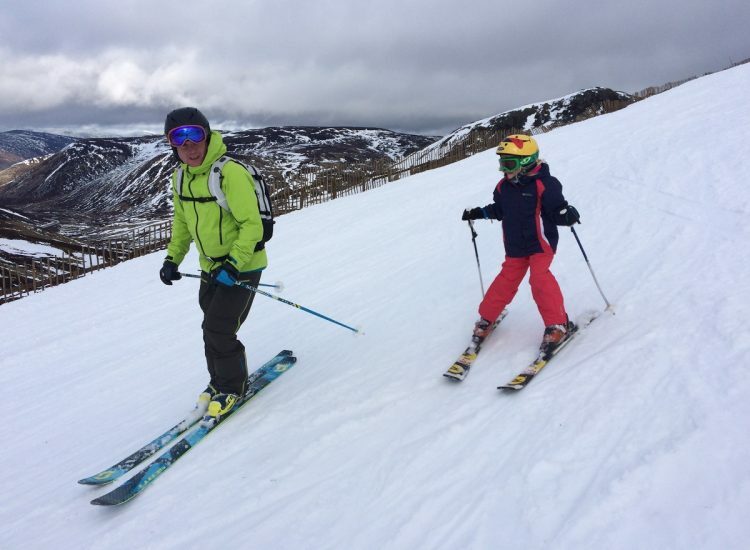 Cyclists, runners, hikers and of course recreational skiers who aren’t interested in heading off-piste but love the idea of ski touring. 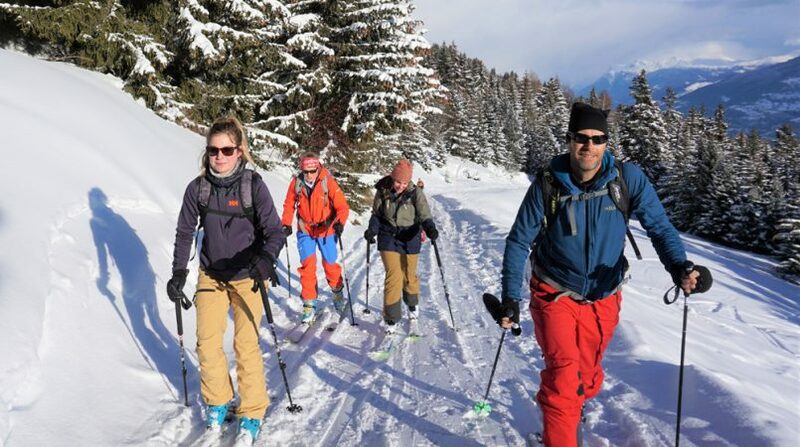 So the evolution of skiing continues, in the Swiss resort of Crans-Montana where a series of marked and controlled touring routes, 14 of them in total, with varying levels to suit all abilities, now exist to allow ski tourers the chance to enjoy skiing or splitboarding up the mountain on their own steam without the concern of potential dangers faced in the backcountry and with the possibility of descending back on marked runs. I was fortunate enough to experience this ‘Rando-Parc‘ for myself on a recent trip to Switzerland. 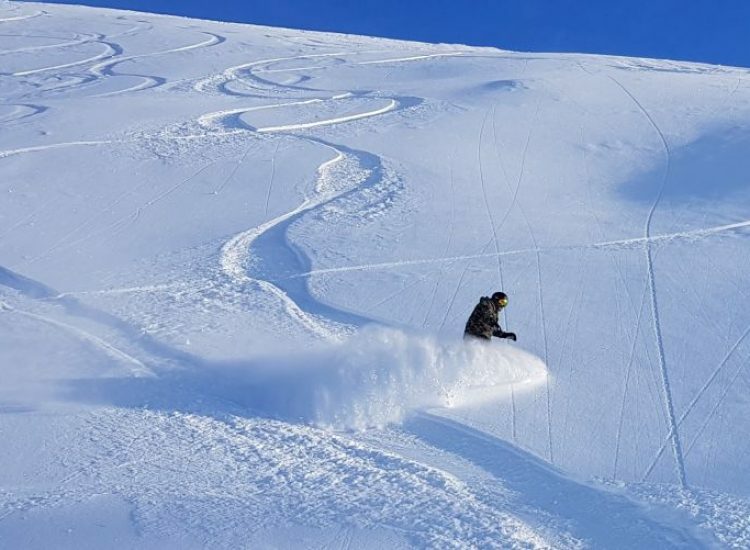 The whole idea is to provide skiers and snowboarders a huge network of trails (it’s not the only thing of its kind but it is the largest) that start in the resort and end on various peaks and notable spots much further up the mountain. 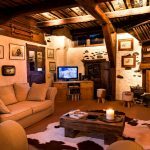 There’s three levels, blue, red and black and plenty of opportunities to bail out early on any of the routes if you decide enough is enough and that Chocolate Chaud is calling out too loudly. The routes are marked well enough that a guide is not necessary, although local ski instructor Dimitri joined me and a group of fellow tourers, including a split-boarder, for route 14, a red trail to the top of Petit Mont Bonvin (2383m). 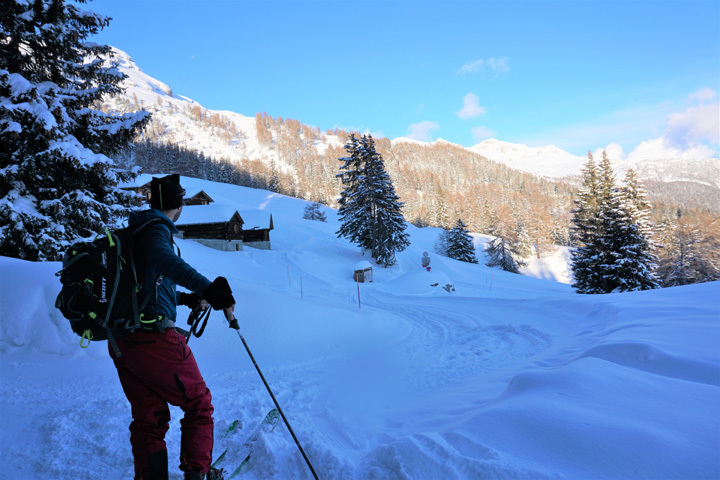 It took us just over three hours of gentle to moderate walking with our rental touring skis and boots with modern, lightweight pin style bindings. We departed from the resort (Aminona) at 4pm and arrived at the top around 7pm. 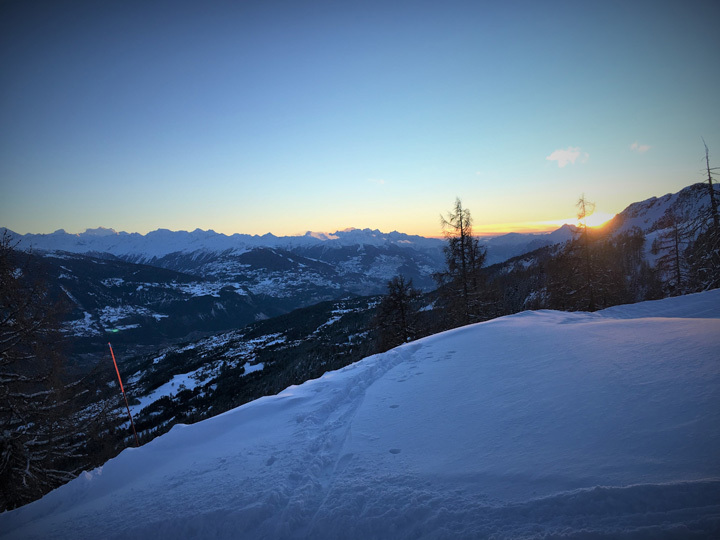 Of course being late January, it was dark by this point and we enjoyed a descent of the pistes with our head torches to guide the way, before finishing at the Restaurant Cure for a cheesy raclette. It was a little bit chilly, but nothing that a couple of shots of Morand apricot eau-de-vie couldn’t cure. 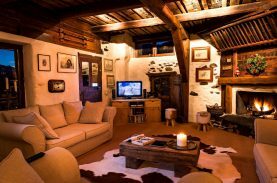 For anyone searching for that genuine touring experience without having to become exposed to potentially dangerous terrain or descend in difficult off-piste conditions, then the Crans-Montana Rando-Parc is ideal territory. 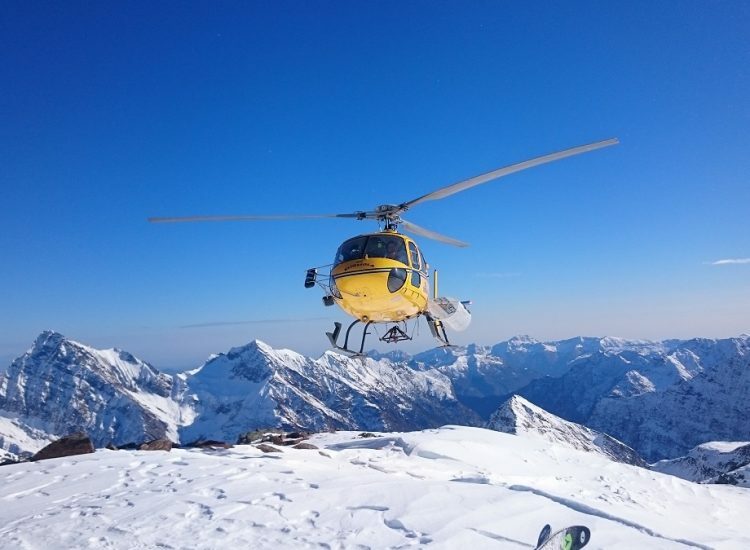 Ski touring has definitely come along way forward. 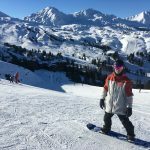 Stretching from the Rhone valley to the Plaine Morte Glacier at 3000m, Crans-Montana is a sunny region with a breath-taking view over a string of mountain peaks that unfold from Bietschhorn to Mont Blanc via the Matterhorn. With its lakes, forests, glacier and vineyards, the region has something to offer every nature lover. Sports fans, too, will be delighted to discover a large array of amenities dedicated to sporting activities, whilst cultural devotees will enjoy the wide range of museums, events and festivals. In fact, Crans-Montana combines all the benefits of the urban lifestyle within a mountain setting, with a wide selection of restaurants ranging from mountain huts to award-winning restaurants, numerous boutiques and shops, a wellness centre, a variety of entertainment and a vibrant nightlife. SWISS, EasyJet and British Airways fly directly from London (and other airports) to Geneva. Rail tickets are available to purchase from www.sbb.ch. Rob stayed in the 3* Hotel Elite.